Metro DC Lawn and Garden Blog: Who (or what) influenced you to be “green”? Who (or what) influenced you to be “green”? 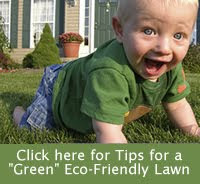 I’ve often mentioned on this blog why I started being more eco-friendly in my landscape. The primary reasons are: wildlife and my husband. I have always liked having birds and butterflies in my yard but until I really started doing some research, I didn’t realize that I would attract a lot more of those critters by getting rid of chemicals (although that one seems really obvious now) and planting native plant species. As for my husband’s role, he has always been very concerned about the environment, primarily because he likes to fish. He is the one that explained the whole groundwater connection to me. How everything that goes into the ground can end up in the local water supplies, etc. The first time I saw him nurture an ailing plant, or gently release a fish back into a stream, I realized how dumb it was to ever categorize anyone by their habits or their occupation. Between the influence of hubby and the hummingbirds, once I started to be a “green gardener” I was pretty much hooked. Our gardens give us so much joy, juicy food, fragrant herbs, beautiful birds and butterflies, that just want to keep learning more and more ways to keep things “green”. So, who (or what) helped influence you to make “green” changes to your yard? Who talked you into your first rain barrel? Or taught you the joys of native plants? Or the pleasures of gardening for butterflies? I would love to share some of your answers.